Homosexuality – Right or Wrong? In today’s world, the homosexual agenda has taken over and turned wrong into right. Television and the media have placed this sin ever before us. Worldly teen girls find it the “thing to do” nowadays. But the Bible stands firmly on what God considers an abomination. Just what is an abomination? It’s not a word we use every day. But it’s a word that is used in 69 verses in the entire Bible: 65 verses in the Old Testament and four verses in the New Testament. I don’t know about you, teen girl, but when a word is used this much in the Bible, I pay attention to it. 2. The object of detestation, a common signification in scripture. The way of the wicked is an abomination to the Lord. Prov 15. 3. Hence, defilement, pollution, in a physical sense, or evil doctrines and practices, which are moral defilements, idols and idolatry, are called abominations. The Jews were an abomination to the Egyptians; and the sacred animals of the Egyptians were an abomination to the Jews. The Roman army is called the abomination of desolation. Mat 24:13. In short, whatever is an object of extreme hatred, is called an abomination. This gives you an idea as to what the word actually meant at the time the Bible was translated into the English language in the King James Bible. Today’s modern English waters down definitions but when you read what the initial definition was at that time, you begin to realize just how much God hates the sin that is called an abomination. Sit up and pay attention to it! God never changes – He’s the same as He was yesterday and will be the same in 1,000 years from now. If He finds homosexuality a sin in Leviticus, it is a sin in the New Testament and will be a sin in 500 years from now. According to Noah Webster’s definition, God detests and has an extreme hatred for the sin which involves lying with mankind as one lays with womankind. There’s no mincing words here, teen girl. Modern Christianity will have you believe that a homosexual can be saved and still be a homosexual. If that person is truly saved, they will fall under extreme conviction and will remove themselves from that temptation. God considers homosexuality a sin – period! No if’s, and’s or but’s about it. He loves the sinner and He died for sinners such as this. Notice the last sentence: “And such were some of you:” – the Christians who used to be abusers of themselves with mankind and effeminate, were no longer this way. Jesus saves the sinner from their sin. He loves them! But they do not stay in their sin. There is a change in their hearts when they get saved. So back to what the world believes. The world will believe the opposite of what the born-again Christian believes. The world calls evil good and the Christian calls it evil, period! Where do you stand, teen girl? Before you accept the sin of homosexuality into your life, or accept a friend who is a practicing homosexual as a friend, dig deeply into God’s Word and see what He says. They will not inherit the kingdom of God! Plain and simple. In closing, before you think you’re off the hook because you’re not a homosexual, look at the rest of the sins listed in verses 9-11. There are a few there that you may be guilty of as well. It is best to look at your own heart and make sure you are right with God before you begin to point a finger. Amen? Disrespect comes in many forms. When you respect someone, you don’t show anger toward them, you don’t cuss at them, you listen closely to what they have to say, and you give them a special place in your life. We should respect God even more than we do a human being. That includes the time we spend with Him in reading the Bible and praying. That also includes the time we spend in church and what comes out of our mouth. Do you know what euphemism means? It’s when you use one word in place of another. I hear Christians use the word darn a lot. It’s really another word for damn. OMG is a euphemism. Even if you think the “G” stands for gosh, gosh is a euphemism for God just as geez is a euphemism for Jesus. There’s no difference between the euphemism and the actual word – you know in your heart that you are actually referring to the real word but you’re just “cleaning it up” to make it “more Christian”! Or maybe you’re one of those Christians that doesn’t think of the real word when using a euphemism. Other people are listening to you and they know the intended word. Euphemisms are idle words, teen girl. They are just as much cussing as using the real words that the world uses. Training the tongue is a very difficult job in a Christian’s walk. We use these euphemisms out of habit and don’t stop to think that God considers them just as much of a curse word as the real words. It’s a bad habit and it’s hard to kick. I’ve been there. If you love the Lord but you are upset at this post, I pray that you will ask the Holy Spirit to speak to your heart. I would not want to offend the Lord, would you? I would not want to be disrespectful to Him, would you? What if you called your Dad, “Dude”? Would your Dad allow you to address him this way? Of course not! He deserves your respect. Our Heavenly Father deserves even more respect than our earthly parents. Today’s post is a follow-up to the post from July 30th. If you haven’t read it yet, you can read it here Modesty. I received comments both positive and negative comments on this post. But today’s follow-up is written in hopes that we reach out to those young ladies who have the wrong impression of modesty. I challenge you, teen girls, to look for God’s direction in this area of clothing. Remember, it’s not just what you wear but how you wear it that matters. A girl can dress in a burlap sack but if she acts provocatively toward a boy, she has produced the same results as a girl who has exposed her body. So with that said, I want to take this opportunity to share comments from a dear Christian brother, who has a teenage daughter of his own. His comments come from a boy/man’s perspective and I hope and pray that it will open your eyes to the need for modesty. As a man, I can attest to the truth of this devotional. Men are visual; they are stimulated by what they see. I can assure you that if a woman (or girl) dresses in a way that reveals her shape (or more), men will look at her and thoughts of lust will IMMEDIATELY begin. This is true for men of all ages, and it’s a battle that men must fight to keep their minds pure, especially in the day in which we live. You’ll attract nice guys, and you’ll attract bad guys. You’ll attract young men, and you’ll attract old men. You’ll attract athletes, and you’ll attract introverts. You’ll attract the brothers of girls your age, and you’ll attract the fathers of girls your age. You’ll attract those who may seem nice, cute, and have a great personality. But in reality, it’s a facade, because they only want one thing. Also be aware, you’ll attract drug addicts, drug dealers, felons, rapists, thieves, murderers, perverts, and pedophiles. Yes, you will attract guys by how you dress, but you will attract much more than you intended. Many of those whom you attract will take the way that you dress as a cue to pursue you. Yes, you’ll attract guys, but you’ll attract those you don’t want to attract also. When they see you dressed in a way that shows your shape (or more), you would be sickened to know what is going through their mind and hearts, including the bad guys, old men, introverts, fathers, drug addicts, drug dealers, felons, rapists, thieves, murderers, perverts, and pedophiles. Sadly, as a man, I know what goes through the mind of men when they see women dress in a way that shows too much. I shudder to think what would go through the minds of men if they saw my wife and daughter dressed that way. I can’t even begin to imagine what I would do if I could hear the thoughts of their hearts while lusting after my wife and daughter. Let me end by saying this, if you are dressing a certain way because it’s what you want, or if it’s so that you’ll be attractive to guys, you’re doing it for the wrong reason. From my heart, let me remind you that you belong to God if you’re a Christian, and everything you do should be done for his glory, not yours or for anyone else. Does how you dress bring glory to God or does it bring glory to you? Does how you dress aid in stirring lust in the hearts of men? From the bottom of my heart, I humbly ask you to honestly consider those questions. What kind of friends do you surround yourself with, teen girl? Do your friends love you at all times as the above verse says? How about when there are troublesome times? Do your friends stick it out with you? Today’s verse tells us that when friends do stick it out, they grow closer to you – the Bible compares that friendship like the relationship you have with your brother or sister. It’s a greater bond than a mere acquaintance. A true friend doesn’t drop you one minute and take you back the next. If you have friends like this, RUN far from them. You be the one to drop them and keep your distance. These are not true scriptural friends at all. They will bring heartache to you just as the latter part of Proverbs 27:6 states. Their “kiss,” their friendship, is deceitful. They don’t love you for who you are. They want to be with you for what you can give to them – what they can get out of you. True friends are not selfish. They prefer to give of themselves rather than take from you. They go the extra mile for you and don’t care what they have to do. The Bible says that the ultimate display of friendship is laying down your life for that friend. That’s what Jesus did for you! So, teen girl, if you do not have the kind of friends who stick by you and love you for who you are and not what you have, then you need to find yourself a new line of friends. You need to find girls who truly love the Lord! Those are hard to find but they are out there. Yes, it hurts when someone discards your friendship like dirty laundry. It’s also humbling because you didn’t catch it early. But that’s where wisdom comes in. If you stop for a moment and think about that friendship, did your parents tell you they didn’t like that girl? There’s a good possibility they did and you didn’t want to listen. Or maybe they didn’t but you didn’t like some of the things that friend did early on in the relationship but you just shrugged it off. It could be the Lord was trying to tell you something. When looking for a friend, make sure that she is saved – that’s the #1 priority. Then watch her in church and around other kids your age. Is she worldly? Does she strive to be the center of attention with boys? These are areas that will bring you heartache later on. Your right choices now will be worth the effort later on. I have a dear friend that I have known since I was three years old. The Lord used her 22 years later to lead me to Him! She has been by my side, spiritually speaking, ever since! I pray you find such a friend and that you seek the Lord’s guidance when you choose that friend. When you are discouraged and sad, how do you encourage yourself, teen girl? Do you surround yourself with “positive” friends? Do you look for help from your parents? As good as both of these sources are, they are not a permanent solution. Your friends and your parents are human and may let you down some day. God commanded Joshua to be strong and of good courage. Not only did God command it but He provided the reason: for the LORD thy God [is] with thee whithersoever thou goest. God would be there along every step of the way! We have to seek God when we become discouraged. Contrary to popular belief, God is our hope and should be our only source. It is His strength that encourages our weary hearts. God provides us with everything we need to be encouraged. The devil is the one that brings discouragement and fear. But God is the opposite – He is Good – He is love – He loves you! Staying encouraged can only happen if you seek the Lord to encourage you. You have to go to the right source in order to get what you need. If you need gas for the car, you go to the gas station, don’t you? You don’t turn to your friends for it. It’s the same for when you need spiritual gas to fuel your spirit! 1 Sam. 30:6 And David was greatly distressed; for the people spake of stoning him, because the soul of all the people was grieved, every man for his sons and for his daughters: but David encouraged himself in the LORD his God. Psalms 121:1 – (A Song of degrees.) I will lift up mine eyes unto the hills, from whence cometh my help. 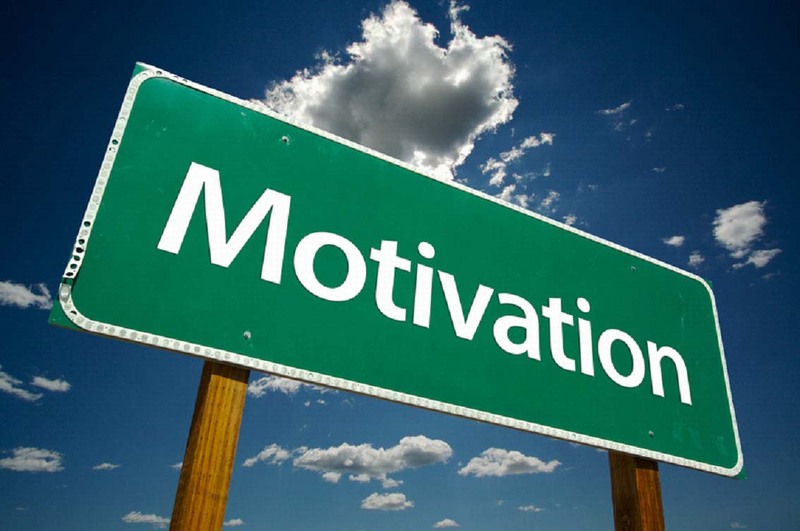 Motivation – just what is it? The current Webster’s dictionary defines it as: the reason or reasons one has for acting or behaving in a particular way. If you love someone, you want to do nice things for that person. The motivating factor there is love, which causes you to behave in that way. But love comes and goes, doesn’t it? You can love a best friend one day and then, bam! That love is replaced with dislike because your best friend has betrayed you. But when you look at a good Christian marriage, what do you see, other than love? What motivates that couple to stay married? I truly believe it is that couple’s steadfast dedication to the Lord and His Word. That steadfastness motivates them to continue in their marriage, whether good or bad things happen. 1. Fast fixed; firm; firmly fixed or established; as the stedfast globe of earth. 2. Constant; firm; resolute; not fickle or wavering. So this verse speaks of a rebellious and stubborn people whose hearts were not right with God and their spirit was not steadfast with God. This means that they didn’t continue in the faith. They didn’t read their Bibles every day. They didn’t “walk the walk” of their salvation but merely played the Christian. Motivation is a result of being steadfast. If you are doing what you know to be right according to God’s Word, teen girl, you will be motivated to do what is right. This will be the gentle “shove” that you need to move forward for the Lord. One who is lazy and unmotivated is one that doesn’t take her walk with God seriously – the Word of God does not consistently dwell in her. When it does, it produces motivation, wisdom and joy! Genesis 19:14 And Lot went out, and spake unto his sons in law, which married his daughters, and said , Up, get you out of this place; for the LORD will destroy this city. But he seemed as one that mocked unto his sons in law. If you read about Lot’s account in Genesis 19, you will see several areas that should cause your eyebrows to raise in disbelief. First of all, he tried to offer his daughters in Genesis 19:8. Secondly, when the angels tried to get him out of the city before it would be destroyed, the Bible says that Lot “lingered”!! Why do you think the Bible says that Lot lingered? What do you think God is telling us here? Do you think it’s because Lot didn’t want to leave behind all that he had worked for? Do you think he didn’t want to leave his friends and his family? Do you think that anything would have been important enough for him to lose his life over, let alone his soul? Maybe he hesitated because he knew what a poor testimony he had been and all his friends and family would go to Hell once their cities were destroyed. As a result, I think the worse thing about Lot’s account is that Lot lost his testimony with his family and friends. Even when he was trying to save his sons in law from perishing, the Bible says that they mocked him (made fun of him). Wow! Have you heard the saying, “Your walk is louder than your talk”? This is exactly what happened to Lot and his sons in law saw right through it. When you compromise God’s word and live an unholy lifestyle, your “walk” (testimony) is ruined to those unbelievers who have been watching you. This is a dangerous place to be, teen girl. You are literally encouraging the unsaved to continue to spit in God’s face because you are not showing them how a person can have victory over sin through salvation. Then when you finally straighten out your life and try to be a testimony to them once again, they will laugh at you. Just as what happened in today’s text. How’s your walk today, teen girl? Have you ruined your testimony to those unsaved friends you come in contact with, day-to-day? Start over – ask the Lord’s forgiveness – go to those friends and ask their forgiveness and try to win them to Christ again. If they mock you, move on and pray that you will be able to have another opportunity to be a testimony to them or that God would send someone else to witness to them.